From illustrator to designer, Mabel Lucie Attwell’s was one of the most prolific and well-known female designers of the 20th Century. Her drawings of cheeky chubby children have won the hearts of people across the globe as they adorn everything from consumer products and books to postcards and dolls. Her talent for observing a child’s world and adapting it to adult humour has secured her a place as one of the most celebrated designers of our time and her work is just as highly regarded and sought after now, as it was in the 1920’s and 1930’s. Born on 4th June 1879 in London’s Mile End, Mabel Lucie Attwell was a natural artist. Her love for drawing led her to study at the Regent School of Art and Heatherley’s before leaving of her own accord as she did not have a liking for formal training and wanted to illustrate her own creations rather than copy existing illustrators works. By the time she was 16 Mabel already had a packed portfolio filled with her drawings of fairies and children, so she approached a leading London artist agency to see if they would sell her work. Although at first they were very dismissive, and not at all enthusiastic about her distinctive style, it was only a matter of days before they contacted her again asking for more as the public had fallen in love with her drawings and every one had literally sold out. This negative reception from her peers for her whimsical drawings was to follow Mabel throughout her artistic life, but these images of children were well received with the general public who enjoyed the humorous drawings. She also very cleverly created different titles for each illustration, using a play on words with naïve spelling, it was as if a child had created the image and the title themselves whilst living in an adult world. It was not long before Mabel’s designs became commercially viable and so she was commission for all sorts of projects including designing posters for The London Underground in 1906 and 1917. Aged 29 in 1908 Mabel married fellow artist, Harold Cecil Earnshaw and one year later gave birth to her first child Marjorie Joan, also know affectionately as Peggy who also went on to become a well known artist in her own right. Peggy was Mabel’s inspiration for the chubby cheeky toddler and steadily these images became the drawings that she is so well known for today. Mabel’s success as a commercial artist was phenomenal and led to her being approached to create illustrations for books. Between 1905 and 1913, Mabel had illustrated ten in total with 4 to 5 colour plates in each for publisher W & R Chambers. Later on she also illustrated for the Water Babies and Alice in Wonderland but her most famed achievement w as when renowned author J.M. Barrie requested that Mabel illustrate his new book “Peter Pan” in 1918. Her popularity was immense and soon her images adorned nearly every child’s popular story book with her illustrations becoming just as recognisable as the stories themselves. From 1911 Mabel started to design postcards and greeting cards for a company called Valentine & Sons who were based in Dundee. These were being sold by the thousands as everyone had grown to love and appreciate these childlike pictures that brought out the child in themselves. By the 1920’s Mabel Lucie Attwell was a prolific and admired artist and her images began to appear on hundreds of different consumer products but it was her affiliation with the pottery “Shelley” that led her into design as well as illustrations. The factory had already broken the mould of producing children’s traditional nursery ware in 1925 by employing Hilda Cowham as an illustrator, this range had been an immense success so they approached Mabel and engaged her to work on designs as well. 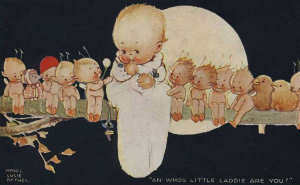 She had just finished illustrating on a range of books which featured a small elf in a green suit, “The Boo Boo’s” so when her first designs for Shelley were registered in 1926 they featured children and this elf like character. Mabel designed for Shelly over a number of years, producing many designs one of my own personal favourites being the stunning Boo Boo “Sleepy Head” nightlight. Aside form commercial products and pottery Mabel also designed for doll companies. One of her most well known characters was a chubby toddler named “Diddums” which was created as a celluloid doll by Cascelloid/Palitory. Such was the success of her “Diddums” doll that they were then made from rubber as were many more of her characters such as “Snookums” and “Little Happy.” Another toy manufacturer “Chad Valley” issued velveteen dolls made by Mabel. These were very popular during the 1920’s as they wore the fashions of the time as well. According to a very close doll expert friend of mine, Mabel was such a perfectionist that when Harrods held an exhibition of her Chad Valley dolls Mabel actually sent her maid along to arrange their hair styles! Her nursery ware sets were used by thousands of children including the Royal Princesses Elizabeth and Margaret and even later on Prince Charles is said to have used the same set. However in 1945 Mabel decided to move to Cornwall to live with her son Peter, where she stayed until her death on 5th November 1964. This celebrated female illustrator and designer had built her life and career around the humorous antics of children and brought out the toddler in everyone. Still to this day products are licensed under her name and are just as sought after as the original pieces from the earlier part of the 20th Century, ensuring that her legacy lives on through the eyes of adults who are secretly still children inside. 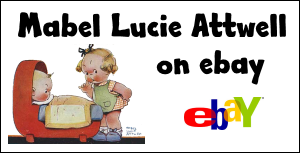 Mabel Lucie Attwell information, news, pictures and more!